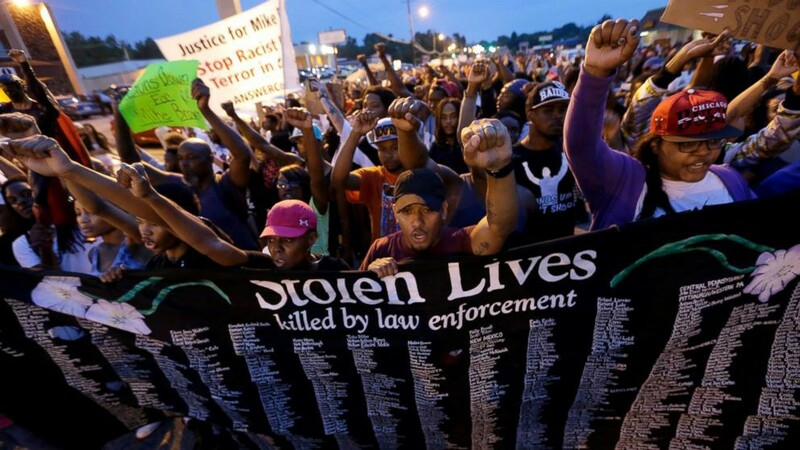 The city of Ferguson, Missouri has been at the epicenter of media attention since the beginning of August. The fatal shooting of teen Michael Brown has sent the city into an uproar and has affected the United States as a whole. Citizens across the country have begun to question if the police can be trusted to protect its citizens and whether or not, we as a nation, can see past color barriers. Protestors exercise their rights to freedom of speech. On August 9, 2014 police officers received a report about an attempted robbery at a convenience store, the dispatcher gave a description of the alleged suspect and the location of where they were heading. Ferguson officer Darren Wilson was the first to respond and arrive on scene. There he encountered Michael Brown, and soon after, he would be shooting this young man four times in the abdominal area and twice in the head. Brown, a recent high school graduate, was pronounced dead on sight. As of now, it is unclear what exactly transpired between the two upon their first encounter. Some witnesses claim that the first shots were fired when Brown attempted to charge the officer, while others testify that Brown had his hands up as a sign of submission, but, Wilson fired anyway. The case has led to the city of Ferguson being divided and protesters have taken to the streets to voice their outrage over Brown’s death. While some take part in peaceful marches about the lack of police investigation, others have taken a more drastic and dangerous approach. Those that protest the fatal shooting, have taken it to the extreme by engaging in hand to hand combat and creating makeshift bombs that they launch at the city’s police officers. Fearing for the lives of citizens as well as police officers, the governor declared a state of emergency for the state of Missouri and the national guard was called in. On Monday August 25, 2014 the late Michael Brown was laid to rest. In an interview, his cousin Eric Davis stated “We have had enough. We have had enough of having our brothers and sisters killed in the streets,” he said. “Hear our voice. We have had enough of this senseless killing.” After days of restless violence in Ferguson, Brown’s parents and family members called for peace between protesters and police. Yet, despite this call for ceasefire, some claim that unless the officer involved is charged with Brown’s death, civil unrest is sure to run rampant through the streets once more.